Sea Spring Plants is based at Sea Spring Farm, a specialist nursery overlooking the English Channel in West Dorset. The business is owned and managed by us, Michael and Joy Michaud, along side our other business, Sea Spring Seeds, which sells a wide range of vegetable seeds carefully selected for the home and allotment gardener. We sell large chilli plants in 1 litre pots. These chilli plants are well grown, but their exact maturity and number of fruit on them will depend on the month you make your purchase. 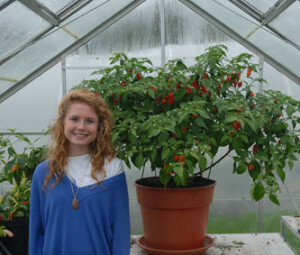 We sell chilli and sweet pepper plug plants from the end of April and up to the end of May. However, we start taking pre-orders for plug plants from October. Mail out of the pre-orders starts at the end of April, with the earliest orders being sent out first. If you do not want to receive you order at a certain time (e.g. maybe you are going on holiday in April) do tell us. We cannot agree to sending an order out on a specific date, but if it helps we can send your order out after a date of your choice. All plants offered by Sea Spring Plants are of chilli varieties that we consider to be exceptional in their class. Several of them are varieties developed by us and are unique to Sea Spring Plants/Seeds. Everything we sell we have grown and tasted. We run trials on our market garden and also ask other gardeners to try out promising varieties. In addition, all chillies that we sell we have had tested for heat level, so the SHU numbers quoted are all based on our own experience. Testing is an on-going process, and trials are done every year so that we can make improvements to the range we have on offer. We have been in the growing business for over thirty-five years. We started specialising in chillies in 1994, which as far as we know, means we were the first commercial chilli growers in Britain. We are plant-hunters and breeders, always on the lookout for new and exceptional varieties. Many of the varieties bred by us, or the results of our plant searches, are on offer as plug plants this year. Check the plant shop for varieties currently available. Dorset Naga, one of the hottest chillies in the world.